Chasing Life: West Land, 260 pages, Rs764. History is full of fascinating stories about the pursuit of eternal life. The Chinese believed that ingesting substances such as gold and jade, which did not corrode over a period of time, would give them longevity. Other cultures followed other—sometimes revolting—practices in their quests for immortality, including eating dog testicles or stag’s heart. The passage of time has not dimmed the lure of such elixirs. 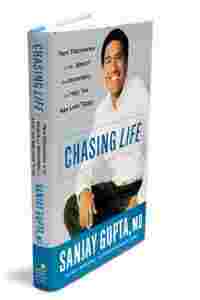 So, in a sense, Dr Sanjay Gupta’s Chasing Life hits the spot for all those who are self-confessed permanence junkies, or “life chasers", as Gupta calls them. The book starts, almost Hollywood-style, by conjuring images of scientists, dressed in white, offering patients youth from little vials—a graphic and attention-grabbing description of stem cell treatments in Russia. Gupta brings in a lot of perspective as a practising neurosurgeon, packing in details on the science of extending life, including some potentially groundbreaking technologies and treatments that are currently in the works. Gupta’s journalistic experience as chief medical correspondent at CNN and columnist for Time magazine come to the fore in his storytelling style of narrative, making the scientific mumbo-jumbo comprehensible to the lay reader. Chasing Life is full of anecdotes of real people trying to live longer, better lives, and not just scientists and their pursuits. There’s Ray Kurzweil, a graduate of the Massachusetts Institute of Technology and now chairman of Kurzweil, who believes he will live at least 1,000 years: “In Kurzweil’s brave new world, we will be beneficiaries of personalized medicine, in which our genome will be scanned, looking for clues to future maladies. We will be able to replace our cells with younger versions of themselves." Unfortunately, all the mind-blowing work that is currently in progress gets less attention than conventional home truths—eat right, exercise, get enough rest, and most importantly, have the right attitude. But, to be fair, Gupta gets credit for sifting through heaps of often conflicting research and distilling relevant information from it. He touches upon the effectiveness of supplements (some vitamins may actually do more harm than good, he says), the wonders of wine and dark chocolate, the myths and realities associated with artificial sweeteners, cellphones and microwavable plastic. As he said in a recent interview to Life Extension magazine: “I’m a doctor who knows something about the media, and I’ve done all this research for you. I wanted to create something that would help people sort through all the information noise and make good decisions." Even the familiar recommendations on how to eat and live in order to remain healthy and productive for the longest time possible are dealt with in sufficient detail. Gupta discusses the role of nutrition, exercise, lifestyle, genetics, environment and attitude in preventing, managing or even checking some of the leading causes of death in our times—heart disease, cancer, diabetes and Alzheimer’s. He gives suggestions for maximizing the positive effects of each, and backs them with scientific evidence. He also illustrates his point with the stories of a 103-year-old woman from Okinawa (Okinawans follow the principle of hara hachi bu, which means eat only until 80% full) and a 92-year-old former executive who is now a record-breaking sprinter, even though he began training at the age of 86. Chasing Life is a worthwhile read, even for those who are up to date with medical developments. For those unfamiliar with these advances, Gupta offers more than just a sneak peek into the future; he equips them with enough knowledge to take charge of their lives.